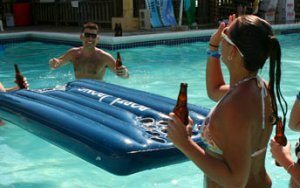 Having a floating beer pong table lying around the pool area is a great way to ensure everybody has a great time. The Inflatable beer pong table is very durable, made of double vinyl, and packs up nice and small so you can keep it in your car for those days you go down to the lake. The great thing about this beer pong table is that after a long tournament with all your friends, you can use it to lounge around in the pool or pass out on it practically anywhere – almost like a portable bed. At the cottage, you simply can’t go wrong with the floating beer pong table. Because it deflates and packs up so small, you can leave that wooden beer pong table at home (or in the closet) and just take your floating beer pong table with you instead. Less baggage, less worries and more fun – that’s what partying’s all about, isn’t it? And when you’re all beer pong-ed out, you can take it down to the lake and relax on the water with it. Don’t forget to brush up on your beer pong knowledge and skills Here, where you can even watch a video tutorial.